Q: What need does your book fill? A: Gentle Hands helps young children learn and remember important social and emotional skills, in a way that is child friendly and fun. Q: How is your book different from existing books on this subject? A: There are lots of great books about coping with feelings, and social-emotional skills more generally. Some of the best, like Hands Are Not for Hitting, are from Free Spirit. 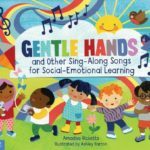 Gentle Hands is different because the songs are fun to use one-on-one or in a group, and the individual songs fit so many different themes and situations. Q: Is this book intended for classroom use? A: Gentle Hands is great for early childhood classrooms, but works just as well one-on-one, or in a library storytime. The songs are written to address everyday feelings and situations young children might encounter anywhere. Q: What about parents who can’t sing? A: Anyone who has a voice can sing, but you do not have to be a singer, or especially like singing, to have fun with the songs in Gentle Hands. The young children in your life love your voice because it is yours, and enjoy singing with you because it is special time spent together. Singing songs is an excellent learning tool for young kids, and singing songs with simple lyrics and well-known tunes can be a great confidence builder for grownups. Q: How did you come up with the different song ideas? A: The first song, “Gentle Hands,” was written to meet a particular need I saw in storytime. After that, I started thinking about other challenging situations and emotions young children encounter from day to day. Working in public libraries, I had a chance to see many kids and families in all kinds of moods. To come up with the words, I did a lot of very silly singing out loud. Q: What made you want to write about a gnome? A: I have always been fascinated by tiny things like insects, miniatures, and microscopic creatures. As a kid, I especially liked stories about fairies, gnomes, and tiny people. So I liked the idea of a gnome who lived in the west, like me. Q: Who else helped with Cortez the Gnome? A: My husband James Orndorf helped write the story, and take the pictures in the book. An artist named Clint Reid helped by drawing the map of Cortez’s adventures. Q: Why doesn’t Cortez look like the gnomes in other stories? A: The biggest difference is his clothing. Most storybook gnomes look like garden gnomes, with bright jackets and red hats. Looking around at the desert, and all the creatures who live there, it seemed dangerous for tiny people to stand out like that. I wanted Cortez and to blend in with his surroundings the way a mouse or a lizard would, to stay safe.